April 12, 2018 | New York, NY – Elated to finally share the latest collaboration with our client Hennessy for their Wild Rabbit “Never Stop. Never Settle.” campaign, honoring cycling legend, Marshall “Major” Taylor. The first iteration of the project was announced this week at a private exhibition hosted at the Times Center in New York City. Our teams have collectively been working together on many facets of the project for months, whereby I am proud to announce our involvement to honor this remarkable pioneer in sports history. Departing from his typical oil paintings, I was asked if Kadir would be able to create a one-of-a-kind monument of Mr. Taylor — and boy did he deliver!We could not be any more proud of the way it turned out. Here is a description of the project (below). Marshall Walter “Major” Taylor, also known as the Black Cyclone, was the most dominant cyclist during the 1890s; a period when very few African Americans participated in the exceedingly popular and emerging sport. Taylor quickly rose to the top of the sport, and searched the globe for competent challengers, to no avail. He eclipsed them all with his powerful display of speed, strength, and daring athleticism. 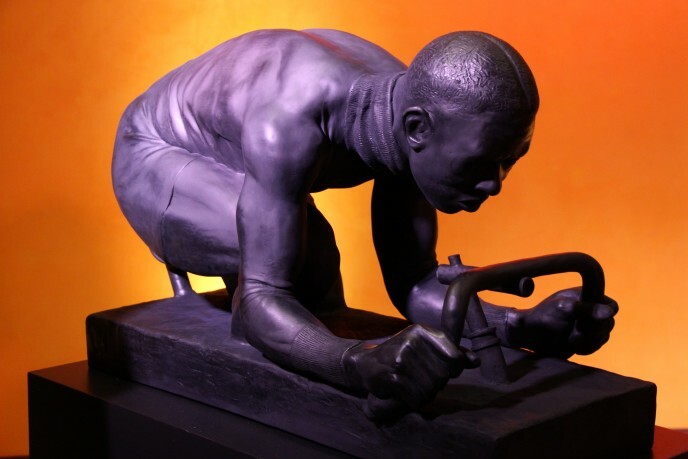 Award-winning artist Kadir Nelson commemorates Taylor with a dynamic 3⁄4 scale bronze sculpture that is full of movement and power. Nelson depicts Taylor in full stride wearing a thin turtleneck shirt, dark cotton shorts, and his signature parted hair style resembling a racing stripe right down the center of his hairline. He tucks and leans into the wind becoming more aerodynamic as he speeds along the cycling track, peering up toward the finish line for yet another victory. A fitting ode to one of the greatest cyclists in the history of the sport. Stay tuned as we announce the next phase of the project and where the bronze statue will permanently be placed to forever honor Marshall Taylor for his contribution to sports on the world stage! As both of us are avid long distance cyclists, this was certainly a labor of love that spoke close to home. Not only this, but when we heard that a monument of Marshall Taylor was vandalized in Indianapolis, we took to work — me in formalizing the logistics to make sure the project would come to fruition, and Kadir, doing what he does best, which is creating timeless art for the ages. Teamwork at its best. Onward!